Winemaker’s Note: Deep red with lush cherry, black currant, and blackberry aromas with a touch of tar and smoke. The highly concentrated flavors are framed by firm tannins. The texture is smooth – almost silky – and masks the firm tannic structure that lies below and only appears on the lingering finish. Pair with grilled, roasted, or stewed red meats and game with intense and slightly acidic sauces (tomato or wine) or with herbs such as rosemary, thyme, and bay leaf. Perfect with most cheeses. 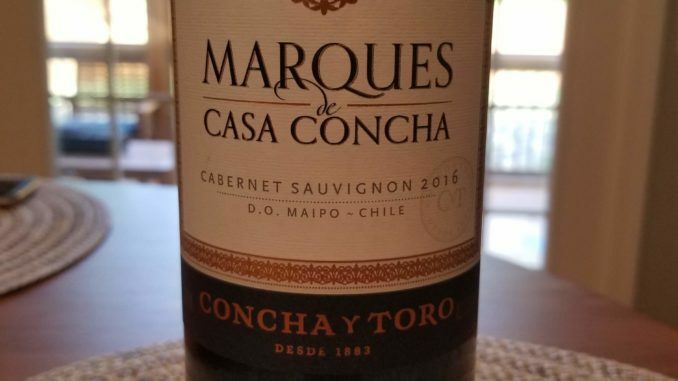 My Review: Ok, a quick disclaimer before I jump into this review – this is maybe one of the best food wines I’ve had in a while. Seriously, it was probably a combination of the food and the wine, but easily one of the best pairings I’ve done (at home) in a bit. Ok…disclaimer over, on to the review. In the glass the wine showed as garnet red, and on the nose I picked up mineral notes of flint and stone with red berry notes that I couldn’t quite put my finger on. Mind you, that was after giving it some time to open; it showed a bit hot at first (13.5% alc/vol). In the mouth the wine showed flavors of raspberry, cassis, and a hint of dark chocolate. What this thing was definitely NOT was a fruit bomb, which I loved (and appreciate). The finish on the wine lingered, with the richer cassis and dark chocolate notes taking over for the raspberry that was more prevalent at the front. My wife and I paired the wine with kabobs. We stuck some steak, bell peppers, potato, and onion on some skewers, threw them on the grill, and added an arugula salad to the mix. It was a fantastic pairing. Seriously, the smokiness of the meat and veggies paired with the brighter front notes and richer finish was fantastic. Honestly, I think any grilled meats would be amazing, but I really would love to do this pairing again. For $25 I really like this wine. It has a bit more character, more nuance, and it’s a great option as we hang onto some grilling days for another month or so here.